Command staff members really cleanup. 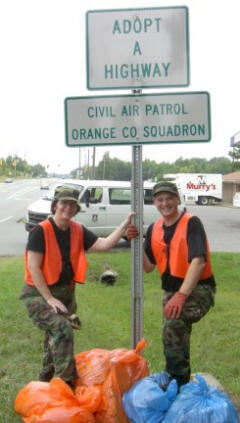 8/2/2009–Hillsborough, NC–Command Staff members from NC 150, Orange County Composite Squadron (OCCS), completed their first Adopt-A-Highway (AAH) 'mission' in Orange County on Saturday, August 1st, 2009. The unit is responsible for cleaning a two mile stretch of Highway in Hillsborough, NC, including Hwy 70A & Hwy 86. OCCS collected over 7 bags of trash and recycleable material (bottles and cans), and helped clean up a major thoroughfare in central Hillsborough. "Adopt-A-Highway is our chance to give back to the town of Hillsborough, while also promoting volunteer service and helping to increase awareness of Civil Air Patrol in Orange County", says Lt Buddy Priest, Deputy Commander of Seniors at OCCS. OCCS has plans to do AAH quarterly, and intends to utilize these events to incorporate safety planning & ORM, communications and logistics with their cadets and seniors. the NCDOT. Its purpose is to decrease the amount of litter on North Carolina's roadsides and improve the beauty and quality of the environment."